“Magic in the Moonlight,” a benefit for the New Orleans Botanical Garden, has become one of the most exciting new fundraisers in New Orleans, so save the date: Friday, October 18. We are honored to have on our cover Anne Abbott, the President of the New Orleans Botanical Garden Foundation; Paul Soniat, Genevieve Munson Trimble Director; and gala co-chairs Dana Hansel, David Waller and Marlene Donovan. In this month’s feature, check out our Fashionable New Orleanians! We are thrilled to show off the styles of Ellen Manning, Tiffany Napper, Mark Romig, Anna Lecorgne Schaefer and Kristin Shannon as they discuss their style and their favorite charities. This month also features our largest ever Registry of Charitable Events for September through December that we’ve ever printed! Be sure to mark your calendars now so you don’t miss out on one of these fabulous events that support all the great nonprofits in our Greater New Orleans area! Not included in that list but also taking place this month are two events for Crimestoppers. On Wednesday, September 11, “Spend an Evening With” Dr. John, Bobby Rush, Sheléa and Blinddog Smokin’ at Generations Hall. And on Saturday, September 28 at Mardi Gras World, celebrate Crimestoppers’ 15th annual’ “La Masque Carnivale.” For more information and to purchase tickets to both events, contact Darlene at 837-8477. I also want to tell you about a cute new store at 3512 Magazine St., specializing in accessories, costumes and gifts with an Aisan twist called Kawaii NOLA. Stop by and meet husband and wife team Adam and Kanako Richard and pick up some Sanrio (Hello Kitty) items or visit them online at KawaiiNola.com. And dream of cooler days while reading our What’s Hot for Fall Fashion Accessories, featuring the best of the new season from earrings to shoes. News flash! My website is updated … You will be getting special offers for books and décor to make your next celebration a success. So start planning those Saints and Pelican parties and “WOW” them with some of the great ideas! 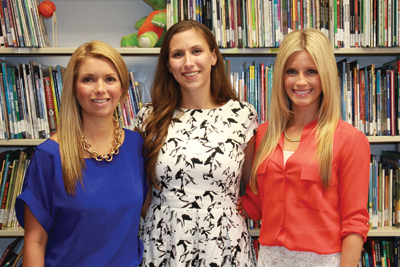 The Good Shepherd School’s “Fall Gala,” co-chaired by Victoria White Baudier, Lesley White Tarantino and Cassie Preston (pictured here at the school’s library), will be held on October 4 at 7:30 p.m. at the Civic Theater. Founded in 2001 by Father Harry Tompson, S.J., The Good Shepherd School provides year-round, extended-day education to kindergarten through seventh grade children. The annual “Fall Gala” celebrates the students’ accomplishments and serves as the primary source of funding for the school’s continued efforts to give at-risk children the opportunity to build brighter futures. This year’s event will feature local cuisine, music, raffles and live and silent auctions. For more information and to purchase tickets, contact Development Director, Jamie Roy by calling 598-9399 or mailing jroy@thegoodshepherdschool.org.